MAHAGAMI campus has comfortable rooms for stay of students, guests and visiting artists. 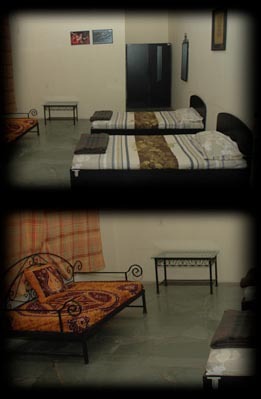 Cottage-rooms with attached bathrooms, geysers, air-coolers / air-conditioners are located within the campus. In addition to these, guest rooms in GANDHI DHAM Guest House within Mahatma Gandhi Mission premises also are available on prior booking. Food is delivered to the inmates as per order.